My dad did not die from a protracted illness and I did not need to care for him. He passed suddenly at his desk one day; shocking our family. He wasn't one to go to doctors, so whatever was going on with him was left untreated. That was in 1992. Why "My Mother Has 4 Noses" has so struck a chord with me, and I would imagine so many others, is because when we lose loved ones we cared about so deeply, something like this concept brings back that love (not that it ever went away) and provides our inner thoughts with "photo albums" of experiences with the person we shared so much with and miss so dearly now. 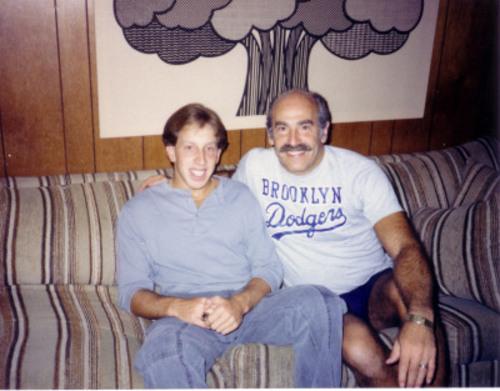 My father and I were extremely close. I was his first and, no disrespect to my siblings, that carried something with my father that bonded us uniquely. Ours was a friendship beyond words. We spoke several times every day, coached sports teams together, watched ballgames all the time, discussed politics incessantly, played catch, shared music (mostly he let me "steal" his "Beatles" and other albums), and had looooonnnnnng talks about everything. We also loved expressively. He taught us that three hand squeezes in a row meant "I LOVE YOU;" one squeeze for each word. Being a male in my twenties, the thought never crossed my mind that I was "too much of a guy" to kiss him hello or nestle. The night before he died, he was lying on the couch watching something. I laid down next to him and put my head on his chest and watched, too. That's how it always was with us. My dad was the guy who went to the bathroom at the diner and was gone for an hour because he had stopped at five different tables to chat. He was the guy who would make faces at every baby or "steal your nose" with his thumb or secretly pay for a kid's expenses to join the Little League team or sit up all night and write game recaps so every kid could get their name in the local paper or visit a senior citizen's home, after a long day's work, to clip bond coupons for them (he was a broker) or speak on the phone for hours with a teacher of mine if I was struggling in a class or sneak up behind us in the street and do his spot-on German Shepherd bark as he pinched the back of your leg. And all of this is why "4 Noses," which I have not even seen yet, makes me cry and smile at the same time with each video Jonatha posts, every review I read or as I listen to the CD. I am experiencing my dad in new ways and I feel blessed as a result. The poems I am posting are not stylistically my best efforts. But they speak to my dad; one as part of speech in memorium I gave for him; the other a "Field of Dreams"-like remembrance. I suspect that another poem is beginning to blossom in my mind ( I see something told through his eyes coming), and that will hopefully spring forth either soon or shortly after I see "4 Noses" on March 15th. Yet wherever I look your love still abounds. Your touch just comes from above. When we share all your love and your pleasure. Miss the games of toss.